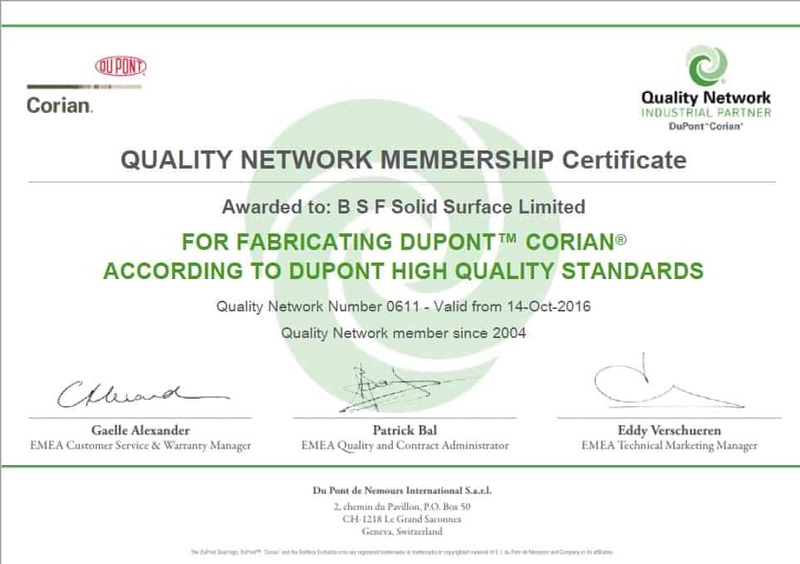 BSF Solid Surfaces Ltd is a member of the Corian Quality Network of Fabricators,the LG Hi Macs Quality Club and the Approved Fabricator Lists for Staron, Hanex, Avonite and Durat in addition to all major Solid Surface material suppliers. What does this mean and why does this matter? This means that our workmanship, tools, quality and fabrication techniques have been independently evaluated by our suppliers, and consequently, BSF Solid Surfaces Ltd have been recognised for our dedication to providing the best quality fabrication. This in turn guarantees our fabrication is of the highest standard of quality, and enables us to offer at least a ten year warranty on the many materials and types of fabrication we offer. If you are interested in talking to us about your projects, or need some advice, literature or samples, please get in touch with us on 01277 263603, take a look at our website or drop us a line to [email protected]. PrevPreviousWhy should you choose Solid Surface over other surface options for your interiors?